My friend's wife had her travel schedule postponed, so what was to be a romantic dinner between us guys turned out to have a third wheel… Sigh… But as it turns out, there were benefits to having an extra mouth around! I haven't been to the revolving restaurant on top of Hopewell Centre for…oh probably close to 15 years. There was never much reason to come back after the initial visit, and it has been a while since I last sat in any revolving restaurants. A few minutes after sitting down, I started feeling a little seasick… I realize that the revolving mechanism was first installed more than 30 years ago, but they really need to upgrade to a new one. The motion was a little jerky, not smooth at all, so that unless one is distracted with conversation or in motion oneself, the little starts and stops are very noticeable. Not a good start to my evening. I was debating between ordering the set menu or doing it à la carte, and probably would have leaned towards the set menu. However my friends seemed to prefer starting with some tapas first, and now with 3 of us, I decided to do something I rarely get to do… which was to "sweep the menu (掃餐牌)". 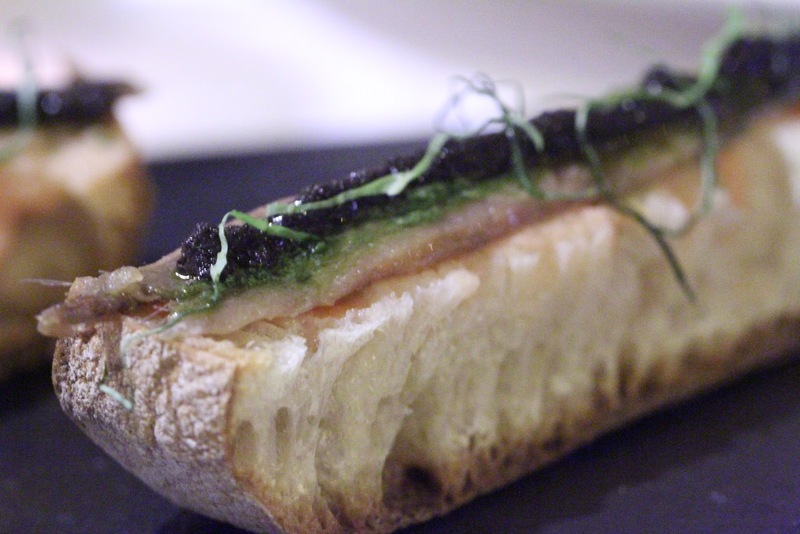 I announced to the manager that "we'll take ALL the tapas... except the jamón ibérico and the foie gras terrine". That would be 8 of them. I loooove doing that! 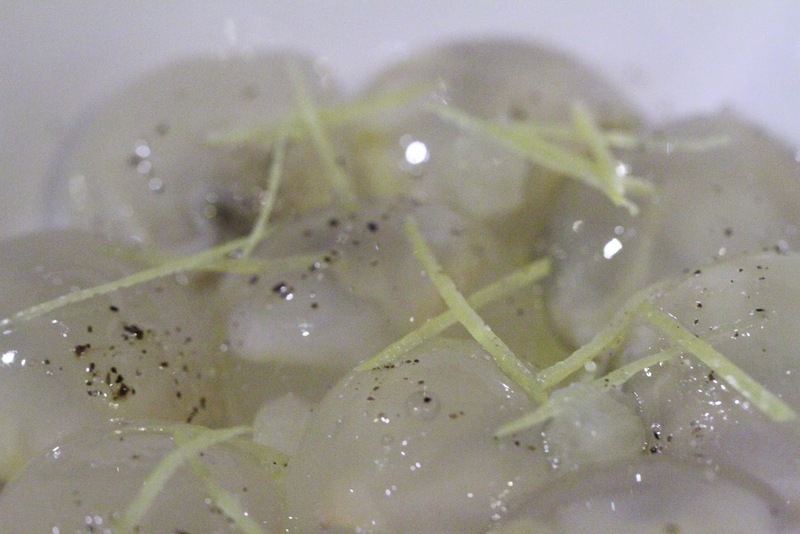 Our cockles: with lemon - the spherification dish. The liquid inside definitely tasted of cockles, although the flavors weren't as intense as I had expected. I also didn't expect having little bits of cockles inside, since that kinda defeats the original intent of spherification. Oh well. "Gambas al ajillo" shrimps: with garlic and chili pepper - the gambas were pretty big, and not sitting in a puddle of garlic and chili-infused olive oil as is traditional. The shrimps are done just right, with a nice amount of bite to show their freshness. They can be dipped in the olive oil at the bottom, or just taken with the small amount of oil coating that's already there. At first glance this dish didn't seem to be anything special, but I got to appreciate the elegance and simplicity of it. 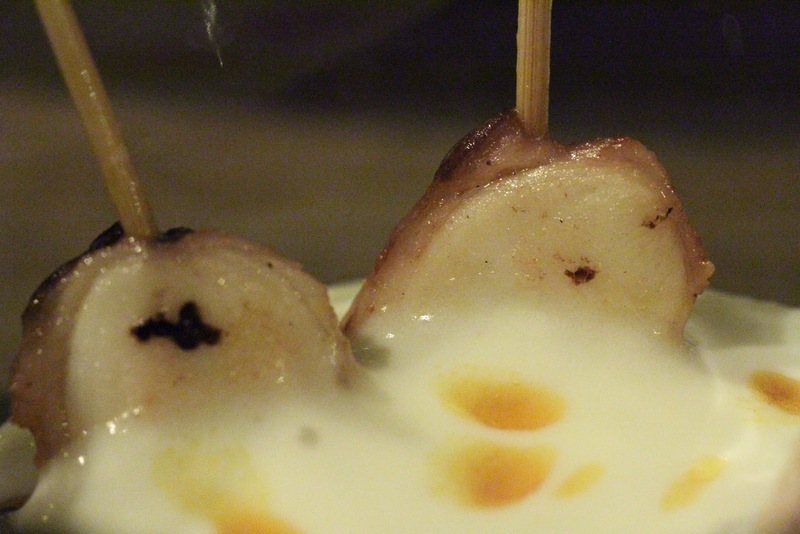 Octopus skewer Galician style - served in a cup of potato foam with some flavors of ham, and a few drops of paprika oil on top. The pulpo was thinly-sliced, with a nice springy texture, and lovely smoky flavors. XXI century omelet - deconstructed into unrecognizable form… Caramelized onions at the bottom, with egg sabayon and potato foam. Pretty yummy, actually. 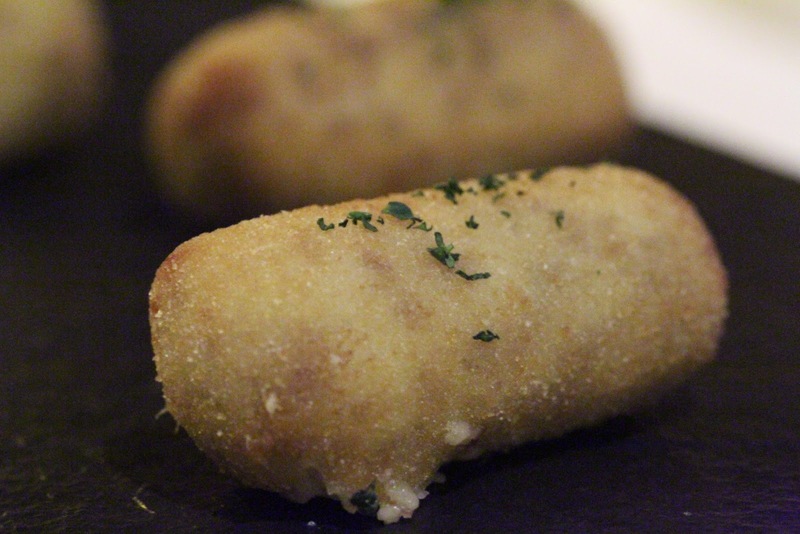 Ibérico ham croquette - not bad, although some pieces looked a little more charred than others. 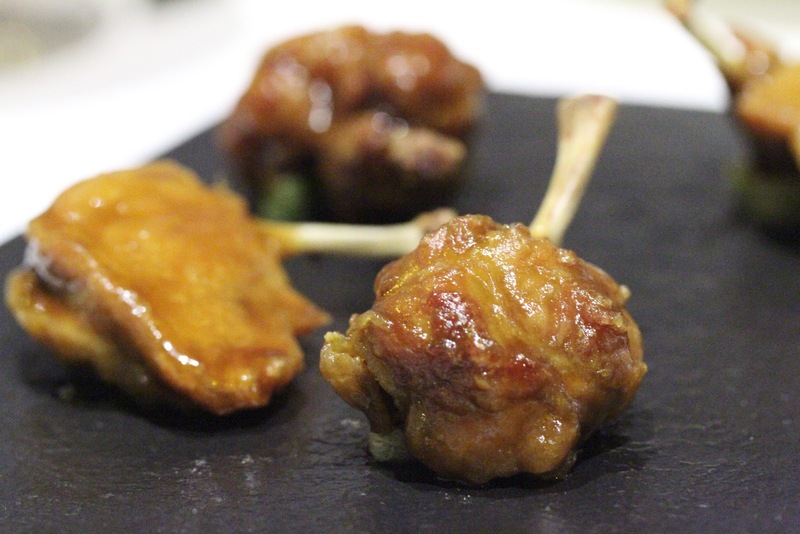 Quail: with soya sauce and spring onion - not bad, with that definitely Asian flavor profile. 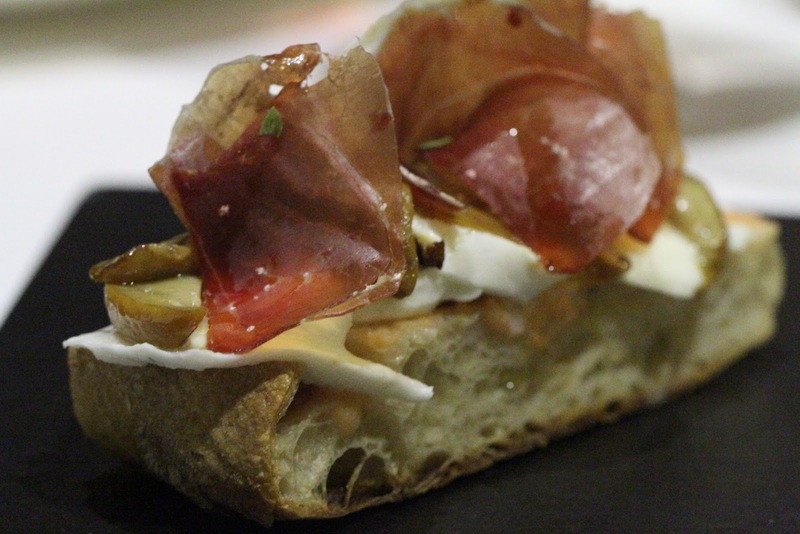 Boletus and ibérico ham on toast - I find it rather unusual for restaurants to use scientific names on menus. I don't know what boletus is, but if you had said "ceps" then the lightbulb would go on inside my head… This was pretty decent, with the relatively mild flavors of mozzarella playing second (or actually third) fiddle to the stronger jamón and ceps. With the arrival of the first set of tapas, I discovered another annoyance about dining in this here revolving restaurant… I had predictably set my camera's white balance to "custom" to reference the current lighting environment, only to find out that my "current" lighting environment is constantly changing as the positions of the overhead lights keep changing as we revolve. I was forced to reset white balance several times during dinner to account for this. Just a little annoying. 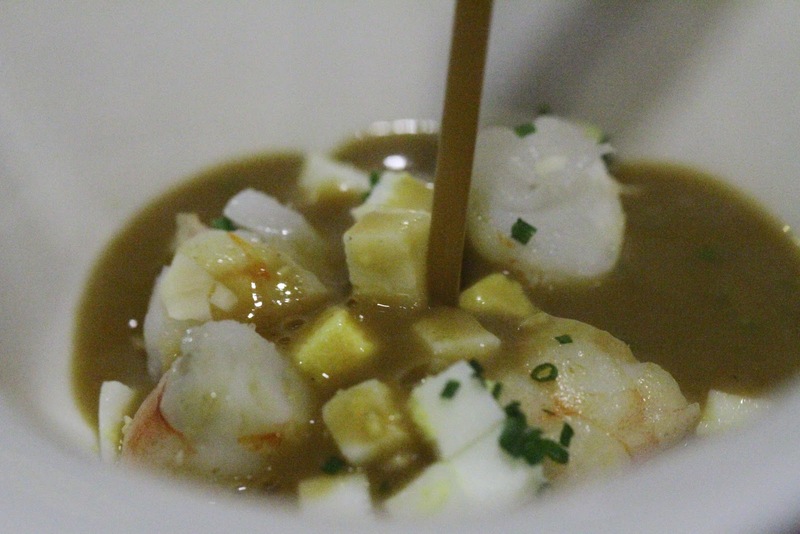 "Bisque de marisco": with almond, egg and prawn - the menu said "spoons" in English (and "湯" in Chinese), and since we are in Paco's place, I was fully expecting my seafood bisque to be served as little spheres sitting on spoons. I couldn't have been more wrong. 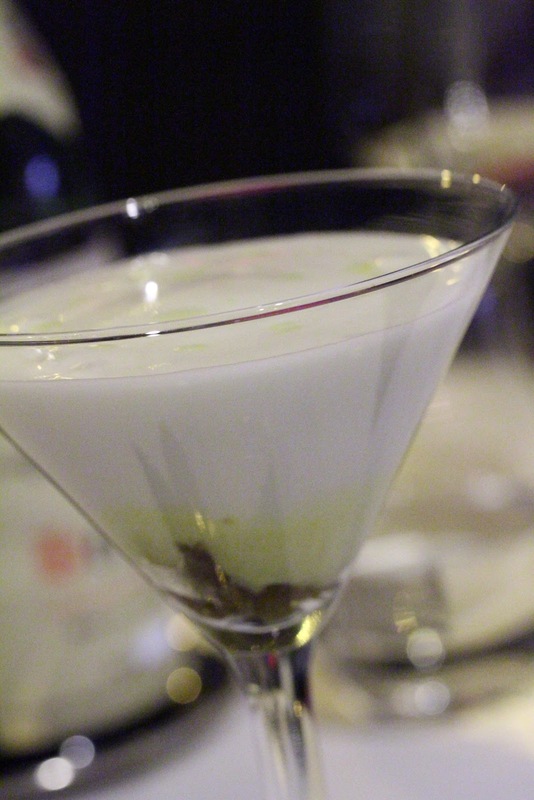 Absolutely no spherification or deconstruction here… just your normal soup. The flavors were concentrated, but the consistency tells me that a good amount of flour was used as thickening agent. 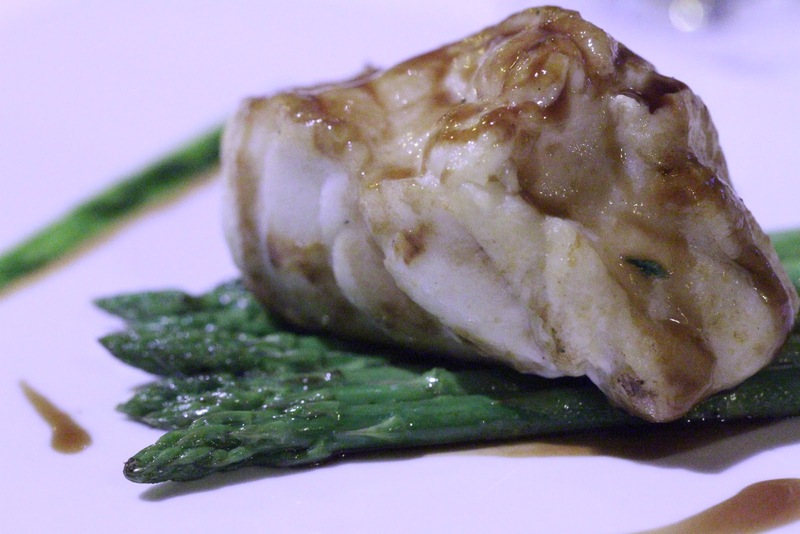 Monkfish: with "picada" in deconstruction and asparagus - none of the meat dishes looked very appealing, and since the restaurant wouldn't offer me the cod pil pil from the tasting menu as a standalone item, I decided on this in the end. The hunk of monkfish was pretty tender and succulent, but there was simply too little of the "deconstructed" picada to be interesting. If picada is so classic Calatan and you saw fit to highlight its deconstruction, why was there so little of it on the plate? And when the deconstruction simply means you have lines of aioli, parsley and almond sauce right next to each other, which you will then smear on the fish, what was the point of this deconstruction anyway? It's not as if the 3 ingredients came in different forms and textures, which were combined to create the final blend! 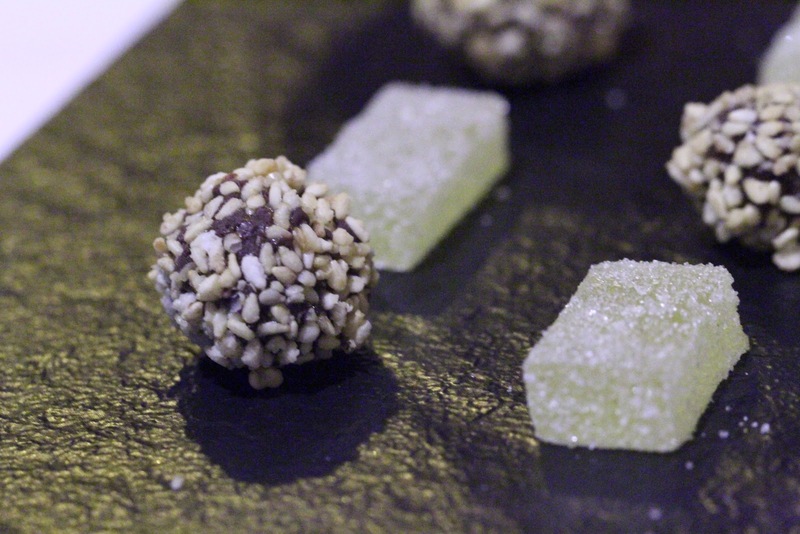 The petit fours came in the form of sesame covered green tea chocolate, and olive oil jelly. 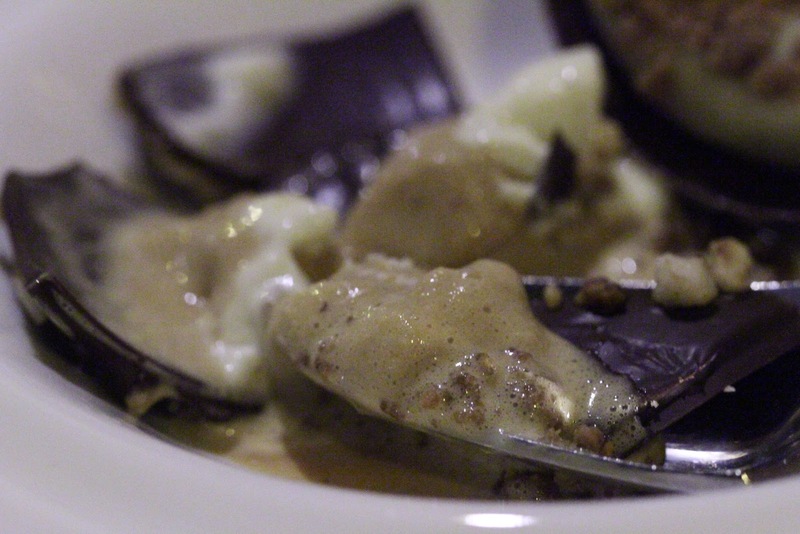 The chocolate was good and my mouth filled with the fragrance of sesame after chewing. The jelly, meanwhile, were a little chewier than I'd prefer, and the olive oil flavors were also a little on the weak side. Honestly, the meal wasn't bad. Some of the dishes were certainly interesting, but the whole experience was a little underwhelming. Maybe we should have gotten the tasting menu, but I was expecting more molecular techniques even from just the à la carte menu. In the end it comes down to value for money. For the food that we had, I didn't think the price point was justified. I could walk into a number of places with macarons from the Rubberman and have a better meal for the same price. So what, I wonder, can the restaurant offer to make me want to go back? 2003 Kongsgaard Chardonnay The Judge - I had the exact same wine two nights in a row… This was decanted 1½ hours before dinner, and was still pretty closed as we poured it from the bottle during dinner. Eventually I asked for it to be decanted again, and the wine finally opened up. Nose of flint, honey, toasty oak, vanilla… a little more restrained and elegant compared to last night. Very well balanced. Curiously the wine has mellowed out since I was blown away by it almost 2 years ago. Wonder how it would evolve… must save my remaining bottles and track the evolution! 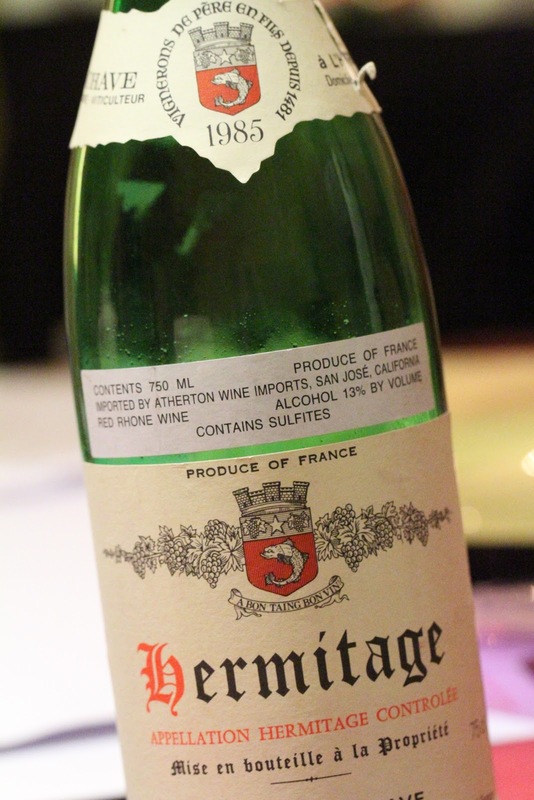 1985 Chave Hermitage Rouge - my friend mentioned that this isn't exactly the best vintage for Chave, since Jean-Louis was distraught with the passing of both his mother and his dog. Opened and poured immediately at the table, showing a huge farm nose, with minerals, leather, minty and plummy nose that was lovely. Later on the savory notes from minerals emerged, along with olive tapenade. The one with the best palate among us, though, thought it was green olives… The palate of the wine faded quickly, turning acidic after a short while. 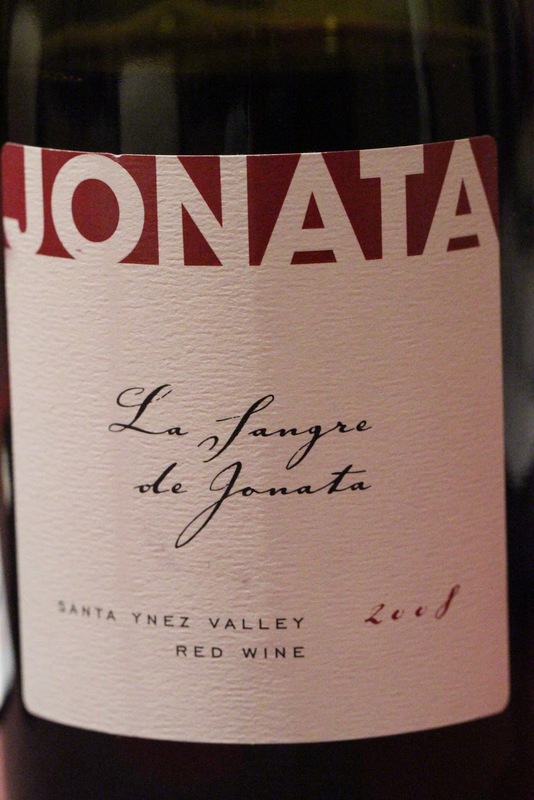 2008 La Sangre de Jonata - opened but stoppered for about 3½ hours before pouring. A very floral nose, but very sharp and alcoholic. Also earthy, metallic, mineral and very sweet. Seriously too young. My first experience with this wine (albeit an older vintage) was more than 5 years ago. 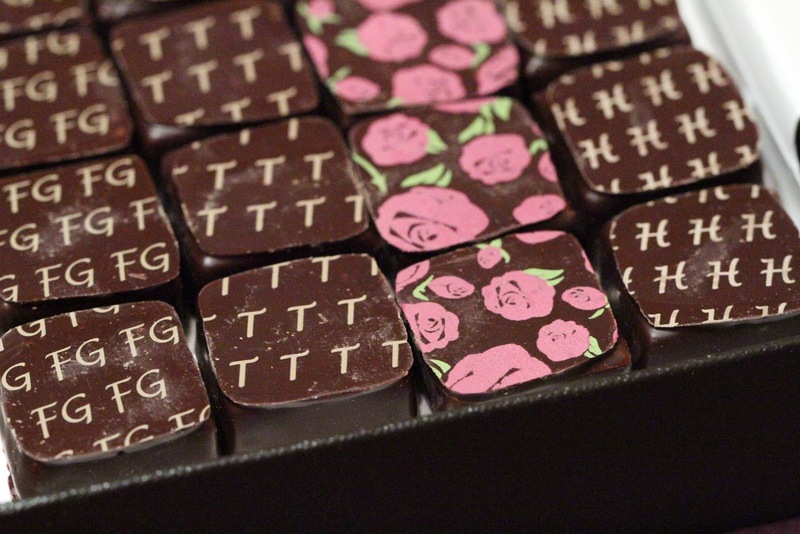 I was treated to some chocolates from Joël Durand. The chocolat noir 68% de cacao et truffe fraîche du Ventoux was not bad, but I had to concentrate pretty hard to pick up the black truffles. 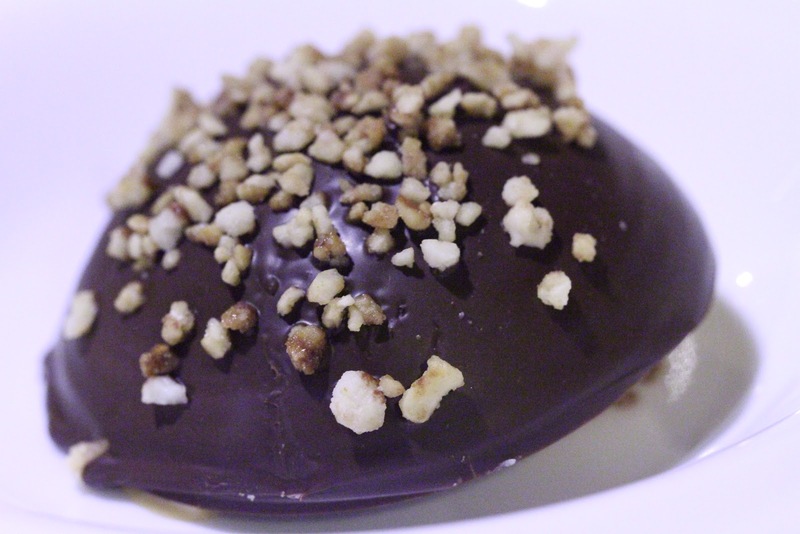 I had a much easier time with the chocolat noir et foie gras frais «maison», as the flavors of the foie was pretty obvious, and also the texture and sensation on the tongue was smooth, slipper and fatty. I am a freelancer with SCMP and am writing a cover story on dining etiquette for SCMP's Food & Wine - from the complaining angle and want to include a sidebar with comments from some food bloggers. Can you possibly email me at chi_ll@yahoo.com so I can email you some questions. Thanks so much.